HI 146-00 is a high accuracy thermometer with a professional grade probe and a flexible 2 m (6.6') cable. The CAL CHECK® feature is incorporated into its function to allow you to confirm the accuracy of the meters any time. 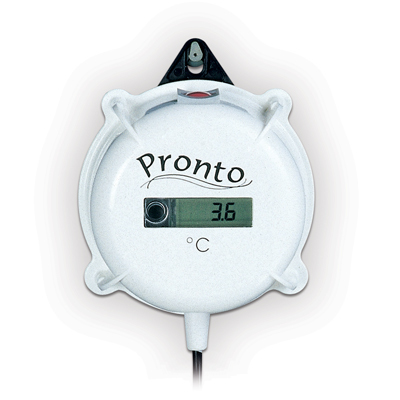 You can monitor the exact temperature of any product continuously and easily observe it on the LCD display. With it's compact and simplified design featuring a fixed stainless steel probe and optional probe holder, this thermometer is ideal for monitoring the temperatures of liquids, semi-solids and refrigerated foods. HI 146-00 can be easily carried from station to station or installed in a fixed position using the molded eye and a wall mount probe holder. In order to make sure that the meter is reporting the correct temperature, HI 146-00 has been designed with HANNA’s exclusive CAL CHECK® switch. By simply setting the switch from “READ” to “TEST” and without requiring any external equipment, users can ensure the accuracy of the meter. In the “TEST” mode, HI 146 shows 0.0 °C (or 32.0°F) ±0.3°C (±0.5°F) which is the accuracy of the meter. With this HANNA innovation, the accuracy can be checked throughout the life of the thermometer without requiring any accessories or additional investments.